Of the 4C’s that value a diamond – Cut, Colour, Clarity and Carat Weight, the Cut is probably the most under-estimated and yet has the biggest impact on the sparkle of a diamond. But are diamonds cut for Certification or to obtain the maximum sparkle? What is the importance of a diamond certificate in the purchasing process? I often ask my customers whether they would purchase a diamond purely on the basis of its grading certificate, and universally the answer is a “no”. However, the irony is, when the same customers are shopping around for a diamond, they compare stones on the basis of the certificate – “I am getting a 1 carat Round Brilliant Cut diamond, F-colour, SI clarity, GIA certified excellent Cut, Polish & Symmetry, for £…”. What is the purpose of a diamond grading certificate? The fact is that a diamond grading certificate, of which the most popular one being from the Gemmological Institute of America (GIA), is only meant to confirm the specifications of the diamond that have been advised to you by the salesperson. It is your record of the quality of the diamond that you have purchased or are intending to purchase. It does not give valuable information on how sparkly the diamond is – in technical parlance, the brilliance, fire and scintillation – the optical properties of the diamond as a result of which the diamond may or may not be a sparkly stone. Even if it is a certified GIA Excellent Cut, Polish and Symmetry stone, it still does not confirm how sparkly it actually is. In fact, I have seen many GIA stones which are not Excellent Cut that have amazing sparkle. Conversely, I have also seen many GIA Excellent Cut graded stones which are in fact ‘heavy cuts’ and dull looking. Why is cut grade important? Out of the 4C’s which grade a diamond – being cut, colour, clarity and carat weight, the cut and correspondingly the carat weight, are the only ones influenced by man. The colour and clarity are a given factor with the diamond rough. Customers often assume that purchasing a higher clarity or colour diamond means that they are getting a sparkly stone – not true. The colour (and in the case of white diamonds colour actually refers to how ‘colourless’ the diamond is) and clarity merely add value to the diamond. Hence, the higher the colour and clarity the more valuable it is. I have seen many diamonds of a lower or average colour grade – say for example: H-colour, but they have amazing sparkle. And this is the influence of cut grade – how a rough diamond is cut and polished which will decide whether it sparkles or not. The assumption is that a diamond is purchased because it sparkles which when set into a piece of jewellery – can then symbolise a certain special occasion – an engagement, a birthday, an anniversary and so on. But in reality, the higher its carat weight – the more expensive it is. And therefore, cutting factories, diamond wholesalers and diamond retailers – all obtain a higher price for a bigger carat weight. It becomes natural that a diamond cutter will prefer to cut a heavy 1 carat diamond than, say, a 0.90 carat stone which is optically a lot better and sparkles much more. The GIA have certain parameters whereby a diamond would be defined for Cut, Polish and Symmetry as Excellent, Very Good, Good, Fair or Poor. Once again, the popularity of the GIA Excellent Grade for Cut, Polish and Symmetry means that cutting factories prefer to cut their rough to get an Excellent grade certificate. Do not get me wrong, this is not a total criticism of the GIA grading system. In fact, I too am a GIA Advanced Diamond graduate. However, I have also been privileged to meet, work for and learn from some highly respected and amazing minds in the industry as well. Within the parameters of what the GIA define as an Excellent cut grade are stones which I would deem to be heavy cuts and optically not ideal as they leak light from under the stone. These would have much better light return from the diamond if the stone was cut a bit smaller. I use a device called Ideal-Scope™ to assist me judge the light return from a diamond. Ideal- Scope™ is an invention of Mr Garry Holloway FGAA, Dip.DT. and is now used by diamond cutters world-wide. It is a simple, bright coloured reflector with a viewing hole and lens. When you examine a diamond with it, the red areas indicate that the light is reflecting off the diamond back to the viewing hole (good). While the white areas indicate that the light is leaking through the bottom of the diamond (bad). And additionally, in some cases, you might see pale pink areas which means that while there is some light return from the diamond there is also light leaking through the bottom (See Figure 1). In Figure 2, there is a photo of a diamond certified by the GIA with its top grade – Triple Excellent – for Cut, Symmetry and Polish. Yet, when seen through an Ideal-Scope, the pale white ‘ring of leakage’ shows in the real life as a dull, dark area because there is no light return from the leakage area. Yet, if this diamond were to be reduced by approximately 10% in its depth, while leaving the diameter unchanged, it would make the stone a lot brighter. It would be good for the customer (and bad for the diamond cutter) because it would be a cheaper stone owing to the smaller carat weight and also a brighter stone. There are a couple of qualifications to bear in mind when using the Ideal-Scope™. Firstly, in real life, we do not look at a diamond with one eye. We use both eyes and the impact of this is demonstrated in Figure 3. Fancy cut diamonds are assessed in a similar way by another tool called an ASET™ while the GIA and most other diamond laboratories do not yet have a measure for grading cut of fancy shaped diamonds; however, the American Gem Society (AGS) are grading some fancy cuts. 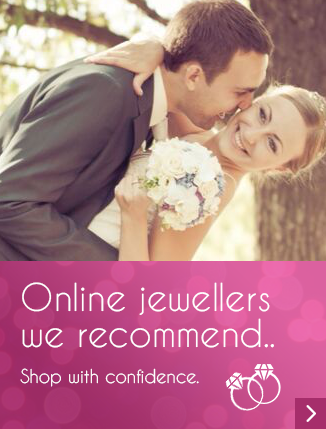 What does all of this mean for you and me – who wish to buy a beautiful sparkling diamond? In your diamond purchasing journey, do not compare two diamonds nor purchase a diamond solely on the basis of the certificate. It has been demonstrated that a diamond certificate, regardless of which laboratory it originates from, does not give critical information on how sparkly the diamond actually is. For this you need to view the diamond(s) before purchase because every set of human eyes are different and our perceptions of what is a sparkly diamond will differ. 1 Holloway, G., “Interpreting Ideal-Scope™ Images”, Proceedings of the First International Diamond Cut Conference, Moscow, Russia, April 23-26, 2004, pg12. 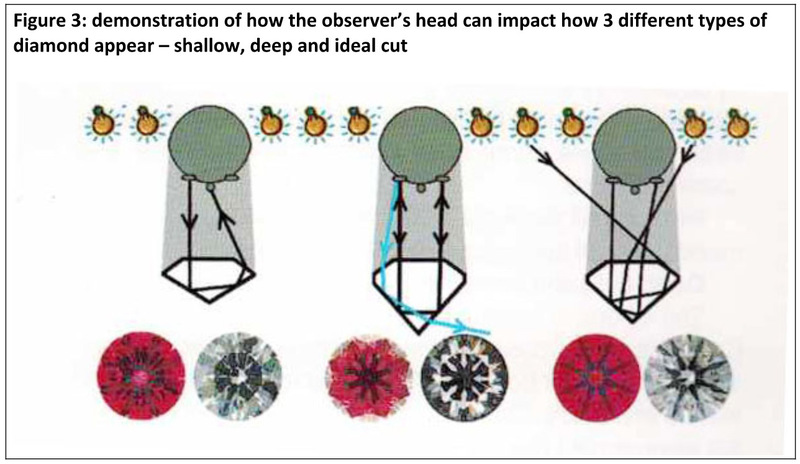 2 Holloway, G., “Interpreting Ideal-Scope™ Images”, Proceedings of the First International Diamond Cut Conference, Moscow, Russia, April 23-26, 2004, pg11. Diamond Cut Conference, Moscow, Russia, April 23-26, 2004, pg40. This article was written by Amit Laxman, Radiant Diamonds, Melbourne, Australia. They specialise in the manufacture of bespoke precious jewellery using natural fancy coloured diamonds and colourless (white) diamonds, www.radiant-diamonds.co.uk. If you Like or Follow them on Facebook or Instagram to receive a 15% discount on your first special bespoke manufactured piece of jewellery. Ensure that you contact them by email with your contact details advising them that you have Liked/Followed them to ensure that you receive your discount. Note: This promotion is open only to audiences in the UK and Europe and it will end on 1 December 2017. Amit Laxman is a GIA Diamonds Graduate and Jewellery Monthly’s own diamond specialist with over 15 years experience in luxury jewellery manufacturing and retail. He is the owner of Radiant Diamonds, loves reading, Bollywood, cricket and Aussie Rules Football, and is a dangerous chocoholic!